While most people associate the silent era with black and white films, a primitive version of color has existed almost from the very beginning of cinema. Georges Méliès was one of the first filmmakers to embrace its possibility, employing a host of artists to hand paint every frame of some of his films. It was an expensive, work-intensive process, but some of these original hand-tinted prints have survived, giving us a look into a unique and long dead process that helped bring black and white silent films to colorful life. It is fitting that Méliès was one of the pioneers of this process. The consummate movie magician, Méliès was always looking for new ways to delight and entertain his audiences, and the enchanting images he brought to life have never looked more lovely than they do here. Through this new Blu-Ray from Flicker Alley, 14 of the filmmaker's works have been preserved in all their hand-painted glory, preserved forever in vibrant HD. The disc also includes narration tracks that mimic the printed descriptions sent to theaters to be read aloud along with the films, filling in backstory and dialogue where intertitles were not present. 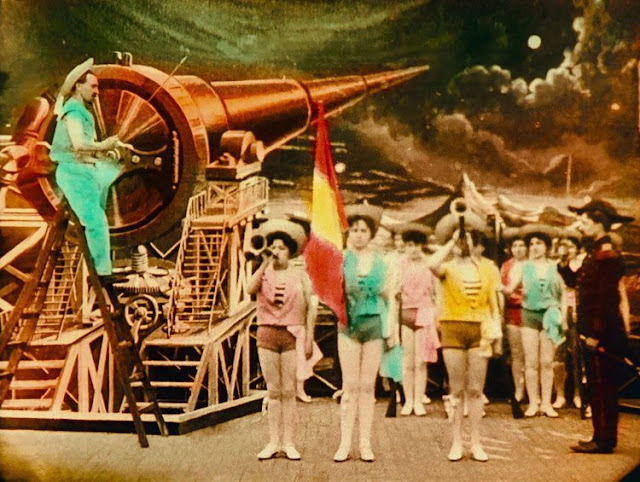 For the young and the young at heart, Méliès' magic remains undimmed by time. Now over 100 years old, these films are as charming and enchanting as they ever were, and through the preservation of these hand-tinted copies, the work, the love, and the artistry behind every frame can now be seen for what they are. A demon summons a vengeful spirit in this early Méliès short, starting off what will become a common theme in the filmmaker's work (see also The Infernal Cauldron). It's also part of a strange phenomenon in early cinema - films focused on women in long billowy robes flailing them around like wings. These were the subjects of many short films and actualitiés from the period, probably because they showcased the movement of the image which was still very new. Not much going on here really, but it demonstrates Méliès' budding artistry that was soon to take flight. Ambitious, even by Méliès standards, Joan of Arc is an early retelling of the story of St. Joan that takes a brief look (although by 1900 standards, 10 minutes was quite long) at her life and untimely execution. Beautiful colors, but strangely stiff - Méliès is more comfortable with fantasy and fun, and the endless parade of extras (really just the same few people over and over) seems like a needless distraction to impress the audience. The lovely pastel quality to the hand-tinting is really what makes this one worthwhile. Otherwise it's an oddly listless and overly serious effort from Méliès that seems outside of his comfort zone. A 15 minute sci-fi fantasy about a group of astronomers who launch themselves to the moon, where they encounter an insectoid race that tries to hold them captive. By 2018 standards it's charmingly quaint, but it's also cinema magic in its purest form. All its tricks were done in-camera, and Méliès made the most of the tools that he had. People appear and disappear in puffs of smoke. An umbrella planted in the ground sprouts into a mushroom. And the spacecraft crash lands into the eye of the Man in the Moon. It's a dazzling display of early cinema's most advanced technology, yet what makes it so endearing even today is its almost naive earnestness. Méliès wanted to wow his audiences, to show them something they had never seen before. He was a magician to the end, and A Trip to the Moon is not only one of the earliest special effects films, it's also one of the earliest narrative films, moving cinema away from the documentary-like "actualités" into a new medium for storytelling. Méliès' take on story of Sleeping Beauty, The Kingdom of Fairies, is perhaps one of his most beautiful and deeply magical films. The story is familiar, of course - a young princess is cursed by an evil witch because she was not invited to her birthday celebration. What follows, however, is not something you'll see in the Disney version of the oft-told tale. 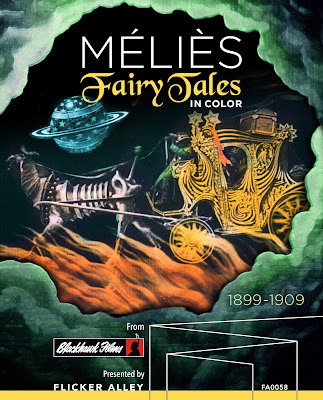 Méliès takes us on a journey through the sky, into the sea, and into the heart of mystical adventure as the prince chases after the young princess to rescue her from the witch. It's a glorious tale, filled with a kind of epic sweep and grandeur that is rare for a film from 1903. The undersea sequences are especially impressive, as Méliès blends two different planes of action that includes real marine animals to create the illusion of actually being underwater. Perhaps one of Méliès' weakest films, Robinson Crusoe takes the classic novel by Robert Lewis Stevenson and condenses it to its barest essence. Racist depictions of natives aside, the film is an attempt by Méliès to be more grounded that ultimately doesn't really work, despite a strong storm sequence. It flies through the events so quickly without inter titles or narration that it's difficult to keep up with, marking a rare failure in Méliès' ability to tell a story visually. Released the year after Méliès' iconic Trip to the Moon, The Infernal Cauldron is a much shorter, but no less impressive, showcase for the filmmaker's prowess for cinema magic. Telling a complete story in just over a minute, The Infernal Cauldron follows the brief exploits of a gleeful demon, whose devilish exploits soon backfire on him as his victims take their revenge. 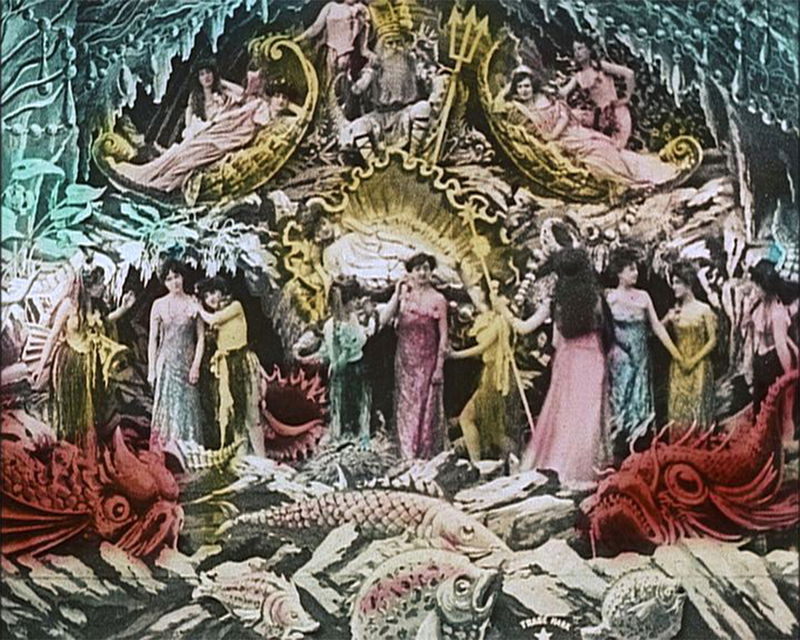 Beautifully hand-tinted, Méliès creates a lovely tableau and dazzles with some top notch visual effects to support the short narrative. A spiritual follow-up to the superior A Trip to the Moon, The Impossible Voyage follows a group of explorers who board a train that takes them across the mountains, into space, and back into the ocean. Slower paced and not as wondrous as A Trip to the Moon the film still features some impressive effects shots and hand coloring, but you can definitely feel Méliès playing the hits here. He even borrows the iconic man-in-the-moon shot from A Trip to the Moon, replacing it with a man in the sun. There's a been-there-done-that feel to the whole affair that makes The Impossible Voyage feel tired and listless, unusual for a Méliès film. The hand coloring on Rip's Dream is surprisingly sloppy, as if it were colored in large blocks rather than any attempt to color actual individual elements of the frame. Still, Méliès is in top form here, relating the oft-told tale with his trademark visual wit and sense of wonder. His use of multiple planes and his exploration of the frame makes for some of his most visually striking moments - the scenes in the forest are especially stunning, as row after top of people descend the hill to search for Rip Van Winkle. The growing trees around his sleeping form add a sense of mystery and magic, creating a lovely atmosphere that make the film one of Méliès' most mystical and wondrous works. Satan comes to Earth to steal some souls, and tricks an inventor into signing his away in Georges Méliès' delightful romp, The Merry Frolics of Satan. Satan then takes the inventor on a wild carriage ride through heaven, before cashing in his ill-gotten contract and taking him down to hell. It's a surprisingly dark storyline, but Méliès treats it with a light touch. 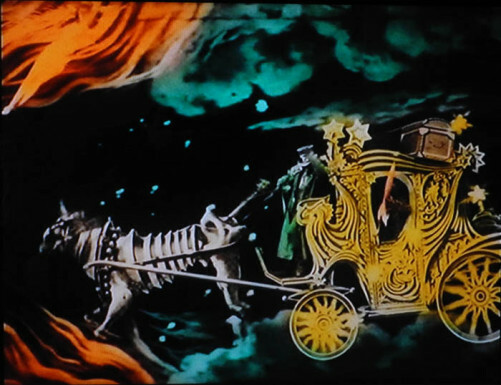 The climactic carriage ride through the heavens, featuring swirling planets and shooting stars, is perhaps one of the filmmaker's most visually stunning sequences; allowing him, if only for a few moments, to break free of the tableau based static frame that was so common at the time, and give us the feeling of flight. It's an astonishing reminder of why Méliès remains one of cinema's most visionary magicians. This 1906 short film finds Méliès experimenting, if only briefly, with close-ups, breaking the usual two-dimensional plane of very specific wide-shot aesthetic made necessary by the size of his studio. The Witch is bookended by these medium shots, setting the film apart from much of the filmmaker's other work. But what really distinguishes it is what happens between those two shots. The Witch is one of Méliès' most completely bonkers works, following the misfortunes of a young man who stiffs a witch on payment her supernatural services and must suffer the consequences. Of course, the witch is vanquished in the end because she's a witch, despite the fact that the young man was clearly in the wrong, but Méliès throws everything he's got at this one. There are giant frogs and owls, fire-breathing dragons, flying witches, vengeful ghosts, and a flaming sword. It's pure Méliès magic, and perhaps one of his most dazzling achievements. One of Méliès' most impressive qualities was his inherent ability to tell well-rounded and complete stories in such a short period of time. In The Inventor Crazybrain and His Wonderful Airship, Méliès takes us into the mind of a crackpot inventor whose dreams of a zeppelin crash lead him to scrap his plans for his latest invention. One of the filmmaker's most beautifully hand-tinted works, Inventor Crazybrain also finds Méliès exploring new ways to escape the one-camera tableau structure that always confined him, restructuring sets around his subject to take us on a fantastic journey into a man's dreams. Yet perhaps what makes it so wonderful is the realization that it's not the inventors dreams being realized on-screen - they belong to Méliès himself. Méliès may be most famous for his grand sci-fi and fantasy work, yet the smaller scale shorts best showcase his wit and love of simple magic. The Diabolic Tenant finds a man renting a room with an unusual method for decorating. Paintings fly up on the wall, stationary objects move on their own, people appear and disappear - it's a short but sweet piece of early silent magic that returns Méliès to his roots, finding joy and wonder in the seemingly mundane objects of every day life. Whimsical Illusions is exactly what its title suggests - this is Méliès at play, casting himself as a magician whose illusions gradually get grander and more complex. This one isn't so much trying to tell a story as it is trying to wow the audience, and it does so with aplomb. Méliès goes from simple card tricks to bringing mannequins to life. The film is really a showcase for what a skilled editor and showman Méliès was. Whimsical Illusions looks like it was shot in one take, yet its magic was brought to life through a series of nearly imperceptible cuts (perhaps some of his finest work) that give this cinematic magic show its sense of realism and wonder. 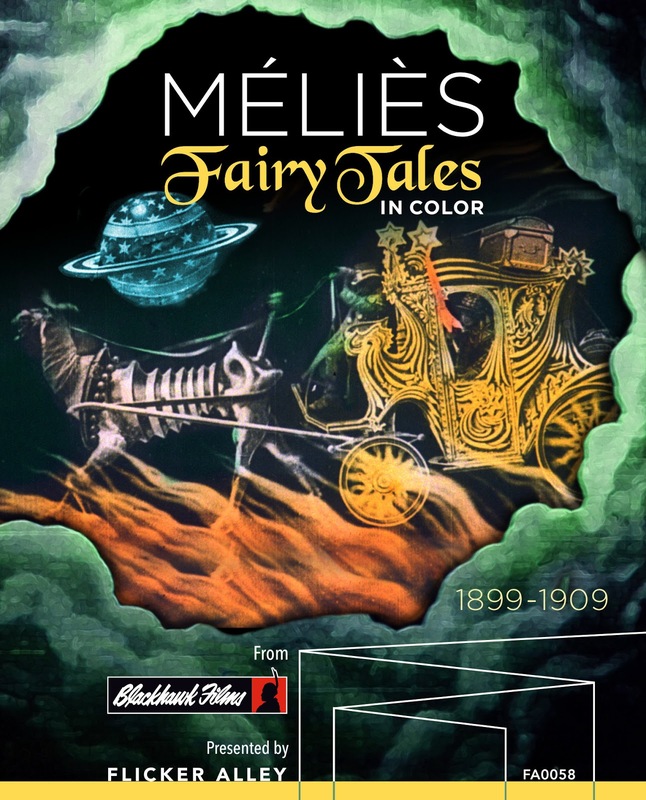 Méliès: Fairy Tales in Color is now available on Blu-Ray/DVD combo from Flicker Alley.